MV Andaman is one of the best-value Similan Islands liveaboard diving boats visiting the Similan Islands & Richelieu Rock. MV Andaman can take up to twenty guests. There are three different cabin options, including dorm, doubles, and doubles with en suite bathrooms. What makes MV Andaman stand out from its peers includes the very-efficient organisation of the European team. The owners of MV Andaman have been operating Similan liveaboard diving trips longer than almost all others. This experience is shown in the safety, comfort, and value of the trips, as well as them knowing what most divers at this price range want from a liveaboard trip in Thailand. The boat's steel hull and design ensure stabilty & comfort throughout the cruise. The rates with and without rental equipment are among the best value, and therefore very popular. Divers who rent Andaman's equipment are also supplied with a diving computer for free. The trips go to all of the best dive sites in Thailand, including as far north as the Surin Islands on trips that include visiting Richelieu Rock. There are 3-day and 4-day trips, and guests can combine two trips at a discounted rate to make a 7-day supercruise. Divers of all levels of certification and experience are welcome on MV Andaman, but Open Water divers need to take the PADI Adventure Deep dive on board to become certified to 30m (99ft. ), or they can join the PADI Advanced course for an unbeatable price that includes extra dives before or after the trip. In addition, non-diving guests are more than welcome to join each cruise for snorkelling, sunbathing or just enjoying the fresh air, good food and fine company. Non-diving guests receive more discount than on most other Similan liveaboard cruises. MV Andaman cruises are very popular, and this is not surprising. The professional, experienced and friendly team make sure that everything is taken care of before, during and after each cruise. The range of cabins makes for comfortable and sociable trips. There are two 6-bunk cabins for divers on a budget. These air-conditioned cabins have sea-view windows, and each bed has a privacy curtain. At the front of the boat there are two double bed cabins, which are possibly the best-value double cabins on any Similan liveaboard diving boat. At the rear of the 'cabin deck' are two more double-bed cabins, but these have their own private en suite bathrooms. Again, the value of these cabins is almost unbeatable, and they are often sold out months in advance. However, it's always worth asking us if one's available, even at the last minute. On the boat's main deck there is a large covered outdoor dining area, where guests enjoy delicious food & dive briefings. Here, the guests can look at the beautiful scenery of the Similan & Surin Islands without getting too much sun. You can fill out your logbook in and after-diving enjoy a drink. 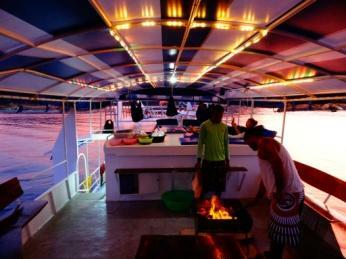 Andaman's top deck is for sun worshippers and those wanting to chill and socialise. It's easy to get a better view of your surroundings from up here, and guests spend a lot of time relaxing, chatting, sunbathing or gazing at the clear star-filled skies at night. 2. Stairs lower / middle deck. 3. Dive station & tank racks. 4. En-suite air-conditioned sea-view double cabins. 6. Toilets / hot-water showers. 7. A/C 6-berth sea-view cabins - private single bunks. 8. Air-conditioned sea-view double cabins. 9. Stairs middle / upper deck & middle / star deck. 10. Dining & relaxing area. 15. Wheelhouse & captain's cabin. 16. Open-air “Star deck” – beanbags & low tables. 17. Covered sundeck – hammocks & sunbeds. 18. Open-air sundeck – sun mattresses. Engines: 2x 6 cylinder 315 HP Hino. Navigation: GPS satellite navigation, compass. Electricity: 220V AC; 24 / 12 V DC (2x 25 KVA and 1x 20 KVA Generators). Compressors: 2x electrically driven Bauer Mariner (230 l/min ). Boat crew: 1 Captain, 1 Engineer, 1 Cook, 1 Assistant Cook, 2 Boat Boys. Safety features: CB radio, life jackets, life rings, fully stocked medical kits, 100% oxygen kit (demand valve, DAN system). Tender: Rubber dinghy with 15HP outboard engine. Taking part in a PADI diving course increases a diver's enjoyment, certification level and experience. Those joining a Similan & Richelieu Rock diving safari aboard MV Andaman have several options regarding their PADI diving course. Firstly, to abide by the best insurance companies' regulations and maximize safety at all times, the management of MV Andaman insist that all diving guests are certified to descend to 30m. 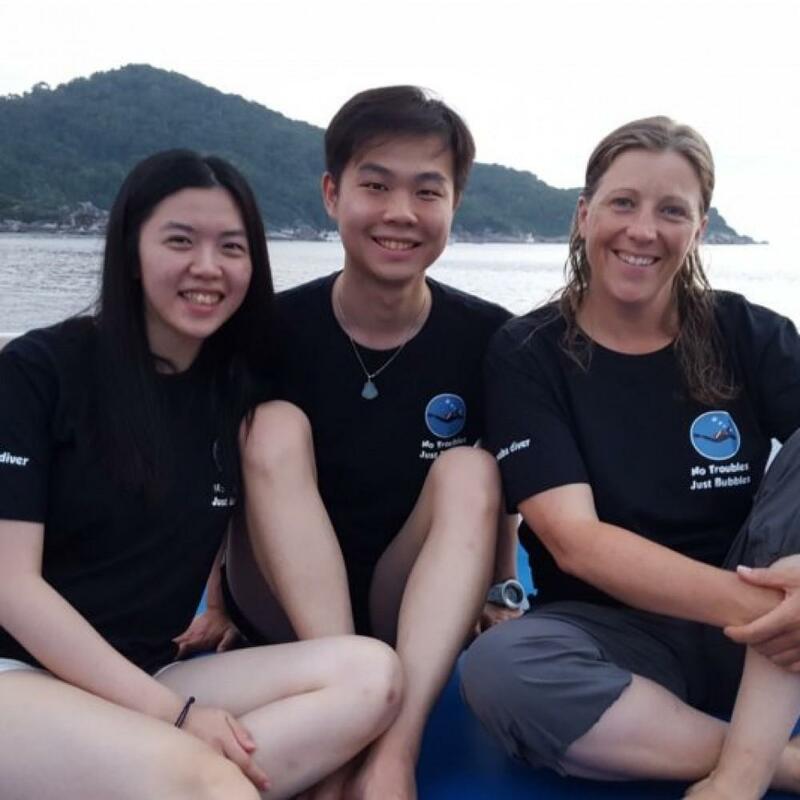 Therefore, those who aren't need to choose between taking part in an Adventure Deep dive (1,800 THB) on board, or the PADI Advanced Open Water Diver (AOW) course. 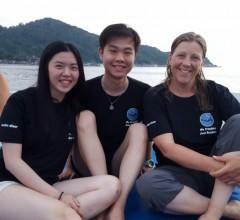 Doing the PADI AOWC includes an extra 3 dives before* your liveaboard cruise on MV Andaman. The AOW course involves a day trip prior* to departure, joining the local boat and enjoying three dives, then finishing the course on board MV Andaman. Prices for this package vary, depending on the cabin and cruise chosen by each guest, but the typical prices are 7,000 THB on top of the cruise price. Not only is this extremely competitive, each participating diver gets an extra day and 3 dives included in the price! Compared to most other boats, on which the 5 AOW dives are just part of the liveaboard cruise, doing the PADI AOWC on MV Andaman is terrific value. 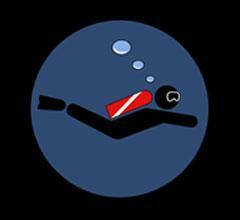 PADI certification fees and the PADI manual are included in the prices. Please contact us for a more accurate quote. Other PADI courses are available upon request at excellent rates. Please ask for details. *It's sometimes also possible to do the three day-trip dives the day after your Andaman cruise. Please let us know your holiday plans for the days immediately before and after your proposed MV Andaman liveaboard trip & PADI course, so that we can help you plan. There are three itineraries, which are 3 days, 4-days and 7 days. The 7-day trip is back-to-back 3&4-day trips. 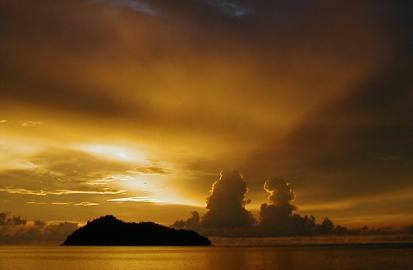 The 4D4N trips visit the Similans, Koh Bon, Koh Tachai, Richelieu Rock and the Surin Islands. The 3D3N trips visit Koh Tachai, Richelieu Rock & The Surin Islands. MV Andaman is one of the best-known Similan liveaboard diving boats, and has an itinerary which is slightly different from most others. As well as a later departure in the evening of the first day, there is BBQ party on board each cruise. At the beginning of each trip, there is a full boat and safety briefing. The first dive of each trip is a ‘check dive’ to enable the cruise leader to judge the ability of each guest underwater, then put divers into groups accordingly. Prior to each dive, a briefing prepares guests for what they are likely to experience underwater. This is a good time to make requests for particular fish or other species. Each dive site is different and home to different species, each with its own hand-signal identification, while sea conditions vary as well, thus paying attention to each dive briefing is important. On one evening of each trip and twice on 7D/7N trips there are three day dives, and a BBQ party is held on board instead of the night dive. Click below for more-detailed information regarding Andaman's itineraries. MV Andaman guests are transferred for free from the dive centre to the boat, waiting at Tab Lamu Pier or Kuraburi in the evening at the beginning of the cruise and back at the end. Departure from the dive centre is at 8.30pm, and the arrival time at the boat depends on which pier it departs from. Tab Lamu is about 20 minutes drive, but Kuraburi a little more than an hour. After returning to the dive centre, and maybe collecting stored luggage or paying final bills, MV Andaman guests are offered transfers to lotel hotels, resorts & guesthouses. For customers who would like a private taxi please see below for details. Possibly the best-value Similan liveaboard available for full charter is MV Andaman. The boat has a steel hull, and was purpose built for scuba diving in 1997. Sailing from Khao Lak from October to May, the trips visit The Similan Islands, Koh bon, Koh Tachai, Richelieu Rock & The Surin Islands. Trips are available in different lengths, from 3 days & nights to one week. 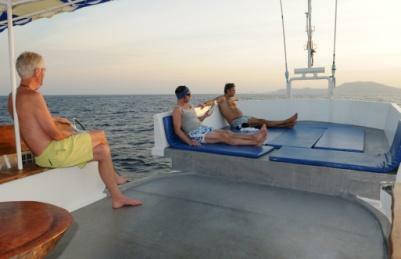 The team are extremely experienced, being among the first to offer diving liveaboards to The Similan & Surin Islands. MV Andaman is among the most-popular Similan liveaboards, mainly due to its reputation and great value. From October to May every season, the boat offers scheduled trips of 3D/3N, 4D/4N and 7D/7N. 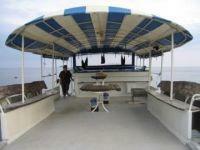 However, for groups of up to twenty guests, the whole boat can be booked for a private charter. The rates are very competitive, but the standard of service, food, equipment or diving does not suffer at all. On the upper deck of MV Andaman there is a partially-shaded sun deck that has a chill-out area with bean bags and low tables. 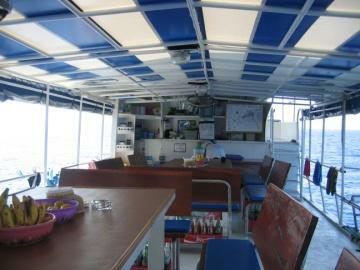 The main deck has the 'communal area' where dive briefings are held and delicious meals enjoyed. Here the guests can enjoy the view and sea breeze, but are sheltered from the weather. The food is simply delicious and there's always plenty for everyone. Diving is hungry work. 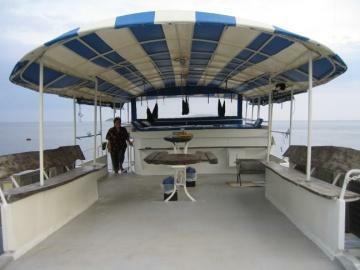 The main deck is where the guest cabins are located, but this is not a dark deck in the boat's hull. Each cabin has a proper window and air conditioning. There are two 6-bunk cabins, in which each bed has a privacy curtain and reading light. At the front of this deck are two double-bed cabins. At the rear of the main deck are two double cabins that have private en suite bathrooms. 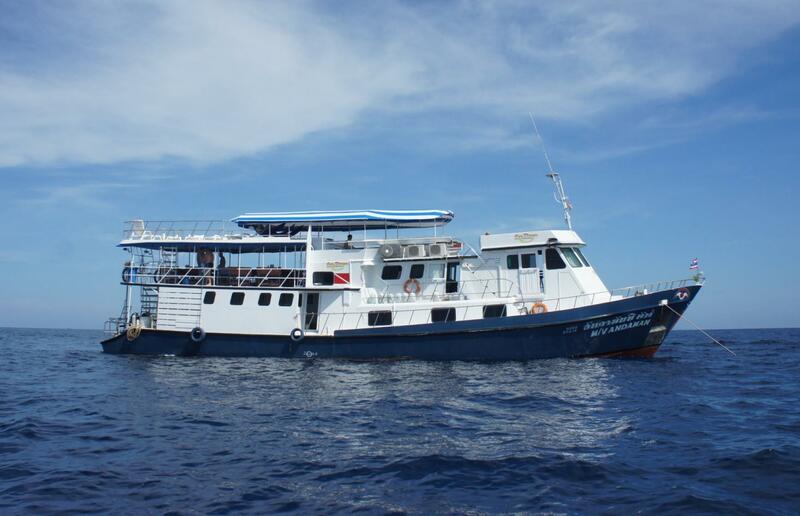 Therefore, this boat is ideal for groups of friends and couples who want to enjoy the best value Similan diving charter trips. The booking process for MV Andaman is very simple & convenient. Firstly, ask us to reserve a space in the cabin of your on the date/trip that you would like to join. We are happy to do this for free, and without any commitment from you. When you are ready to confirm, we ask for 20% of the cruise price as a deposit. This payment is most-commonly made via PayPal, without any hidden fees. You don't even need a Paypal account, although PayPal do encourage you to open one. The PayPal invoice can be sent to any email address and payment can be made by anyone. The 80% balance and extras such as park fees, transfers and any equipment rental and/or courses can be paid when you arrive in Khao Lak. Card payments attract 3% bank fees. 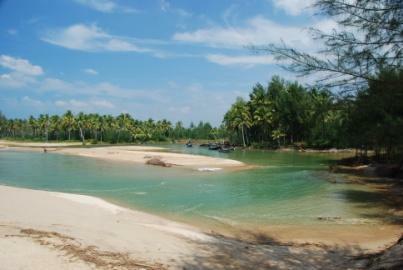 There is an ATM near the dive centre, and several banks in Khao Lak. Guests who cancel their liveaboard trip forfeit the deposit paid, all of which Similan Diving Tours must forward to the dive centre. Most travel insurance policies can protect you from unforeseen cancellation penalties. Awesome trip on the Andaman! The crew is very professional and helpful and dives are amazing! A great trip with sea dragon dive center. 3,000 THB Discount on October departures. 2,000 THB discount on April & May Departures! 2,000 THB discount on March, April & May Departures! Last minute discount for April 29 - May 4, inc. free equipment!